Toasty, cheesy, sweet, spicy, and crunchy. What's not to like? Take your grilled cheese game to the next level with this recipe featuring ooey-gooey brie, hot chili pepper-infused honey, and slices of crisp, tart apple. Everything comes together just as quickly and easily as an old-fashioned grilled cheese. But this elegant interpretation makes you feel like a top chef! Don't forget the fresh thyme. It is an incredible herb that adds just the perfect touch to every bite. Honeycrisp apples also work well in this recipe. If you're feeling particularly adventurous, try camembert in place of the brie. Pair with an elevated version of tomato soup and you have an elegant version of the classic comfort food combination! Per Serving: 853 calories; 38g fat; 98.4g carbohydrates; 32g protein; 116mg cholesterol; 1400mg sodium. 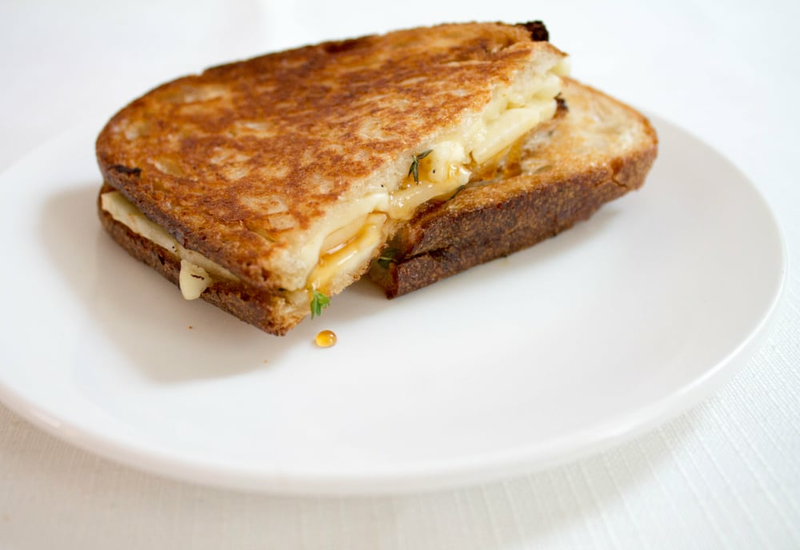 This is like a million dollar grilled cheese sandwich. So delicious! I'm obsessed, can't get enough. The brie is so melty and gooey, I love it. The sweet apple adds a nice sweet kick to this savory and spicy sandwich. A must try for fall! I felt like a big kid eating this sandwich, but it's really a grown up version of grilled cheese! I absolutely love brie, it was so delicious. The chile infused honey was also a winner! I think I found a new favorite. This is my new favorite sandwich. I added some shredded chicken and it was AMAZING. I also forgot to get the honey at the store so I made my own; honey, red pepper flakes, and a dash of siracha. I’m not sure what regular chili infused honey tastes like, but my homemade version was delish with the sandwich. I ended up making this for lunch the next day too because it was that good.